This weekend looks to be another mellow one for us- (we have been sooooo boring lately!) But what I am looking to do is to spend time with the kids and my hubby and to get in some good healthy time. Every once in a while I try to do a really sound check in on my health. When I go to so much trouble to make sure that I eat really well and totally on my allergy free program then I have to make sure that all the other areas of my life are on point health wise too. Since eating “on program” for me sometimes still includes treats (I have some coming your way next week!!) I have to do two things to balance that out. One is that I have been slacking off on my exercise lately, so I am trying to get more walks in before the rain really sets in and regularly make it to the gym. I think I may have to start doing gym instagrams to keep myself accountable every day! The other way is by adding in delicious and healthy dishes like these Roasted Squash Bowls with Arugula Apple Salad . They are so tasty and we had these for dinner the other night with a piece of Salmon on the side. But they are filling enough that you could have a meatless meal, or they would be a gorgeous starter for a dinner party or a perfect side dish for Thanksgiving (Can you imagine a platter of these all lined up for the Holidays?! I used delicate squash for its great flavor and its great shape. 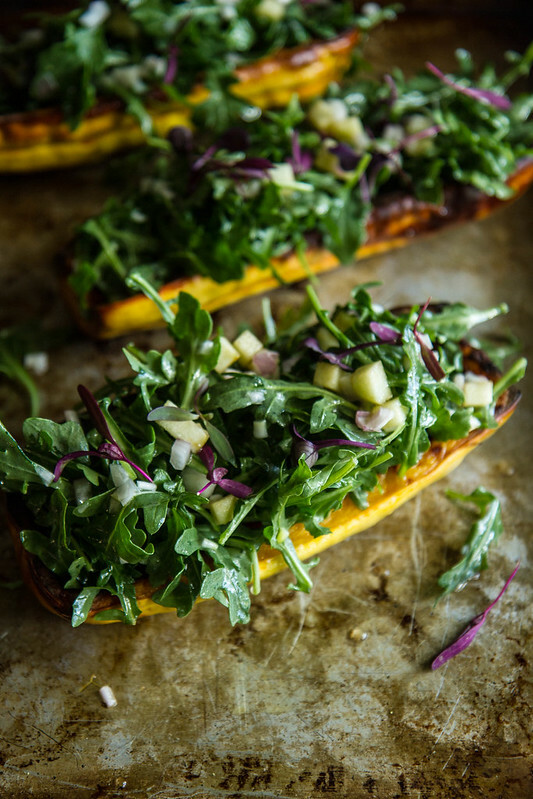 The cool, crisp, sweet and tart apples and peppery arugula are a perfect compliment to the hot earthy roasted squash- you will love this dish! Split the squash in half lengthwise and scrape out the seeds. Rinse the seeds and toss them with 1 tablespoon of olive oil and set aside. Rub the cut side with the remaining olive oil and sprinkle the squash and the seeds with kosher salt. Place the squash cut side up on a sheet pan and the seeds on the side and bake for 20-25 minutes until the squash is tender and the cut side is golden brown. Meanwhile make the Apple Vinaigrette by whisking together all of the ingredients and season to taste with kosher salt. When you remove the squash from the oven, place them on a serving platter. 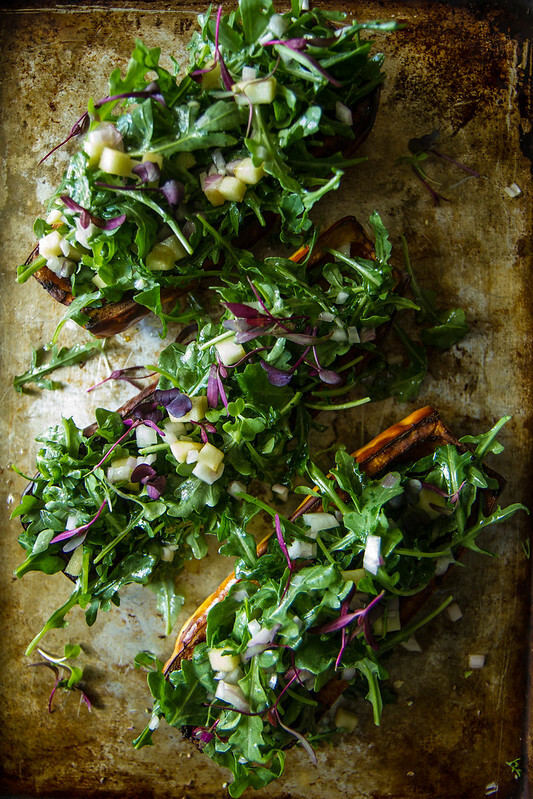 Toss the baby arugula with the apple vinaigrette and season to taste with kosher salt. Pile the salad into the roasted squash and sprinkle with the seeds. Serve immediately. A dinner party worthy salad for sure. And I know what you mean about the healthy reset. I have been making way too many treats lately and with the holidays coming I know it will only get worse. I need salads and lots of them! So lovely! I would love this for lunch today!! Woah! All these goodies are right up my alley. I love how darn nutty arugula is. This looks so simple to throw together on a weeknight. these are beautiful! dreaming of seeing a half dozen lined up for the holidays! Mmm! I was just looking for some extra Autumn feeling veggies to go with the Spanish Chicken & Quinoa stew recipe I’ll be trying this week for gen’t lunch 🙂 He’s on the healthy foods bandwagon! !